Hi, my name is Caroline and I would like to offer you a “dreamy” welcome to my website. Well, I say dreamy but if you’re in the same situation I was some months ago, the chances are you’re feeling anything but! Just to give you a bit of background information on why you see this creation before you today, I was in a pretty bad place some time ago and if this is the same with you, I am happy to let you know that a good mattress can really turn your world around. It could be that you’re the same as I was and you’re fed-up with those aches and pains that bug you every morning when you wake-up. It could also be that you’re just looking for a new mattress and have already done a whole load of research on the internet, or have been to your local store and still can’t find a mattress that will suit your needs. Either way, I happen to be an avid lover of memory foam and I also believe that you don’t have to take out a second mortgage so you can pay for it. So, in the following pages you won’t just find reviews on what I think are some of the best brands of foam mattresses on the market right now, but also a good smattering of other pages that are there for information alone. In fact, I like to think of my website as a place where you can find all the information you need in one place. If you already know what type of mattress you would like, or you don’t have the time to navigate through my website until you find the right one, I have added a comparison table for you. 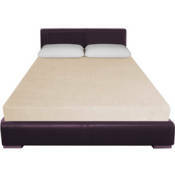 In this table you will be met with straight to the point facts about model, type, size and a whole host of other easy to see facts on the foam mattresses I have here. At the end, if you do have time for that cup of coffee I have also added a link so you can read the full review on the product you’re interested in. Confused About Which Mattress to Choose? No problem. I have plenty of informational pages that will help you understand how to choose a memory foam mattress, what type might suit you best and much more. Below is a list of what I have included and you’re more than welcome to click on the link if you would like more information. When I was researching my own mattress, I soon became very confused over what firmness I “should” choose and which is best for me. So, in this informational page, I hope to clear up any confusion for you. This page will explain everything you need to know about density, and if you’re new to the world of memory foam I’ll bet you’re already a little confused about what all this means. Again, this does depend on firmness, the density of your chosen foam mattress and personal preference so I couldn’t leave this page out. Once you’ve finished reading it I hope things will seem a lot clearer for you. If you’ve managed to wade through all of the information above without falling asleep, I now move onto my best picks for memory foam mattresses. For my best overall I choose the Zinus Green Tea because it’s a high quality mattress for a very fair price. This mattress comes in 4 different heights and 6 different sizes, but the reason I chose this model isn’t just because the sizes will suit a wide range of people – it’s the balance of firmness and comfort what makes the Zinus Green Tea such a great choice. If you get time to go through my website, you will notice that I constantly mention the fact that people complain about becoming overheated when sleeping on a memory foam mattress (especially those in the lower price range). 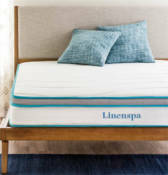 The LUCID by LinenSpa gets my vote because I think the manufacturer has done an excellent job at using technology that will keep you cool all night long. If you want support across all the pressure points in your body and you don’t like the overheating problems many other memory foam mattresses have, this is your choice. With only two layers of foam – support-foam and memory foam – it’s not as diverse as some of the other choices on this page, but this actually helps keep its shape for a longer period of time. Not to mention the comfort level is good anyway. 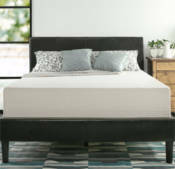 If you like the springy feeling of a traditional coil mattress but you also need the soft, conforming structure of memory foam, you may want to turn your attention to this hybrid option. 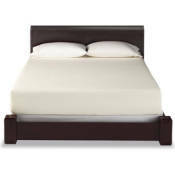 The bottom portion of the bed is made with strong, stiff, firm coils, whereas the top features a thick layer of memory foam. 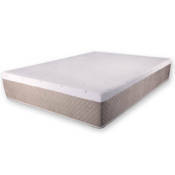 The memory foam will absorb weight in pressure point areas, filling in the gaps from your lower back and your sides. While this mattress is great for those of you who have problems with back, shoulder or hip pain, the reason I chose another one as the best for joint problems is because that one is slightly more plush – something many people with aches would prefer. 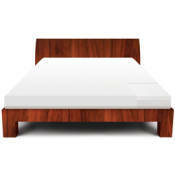 However, if you prefer a firm mattress but also want something that’s gentle on the joints, this is the choice for you. With a special cooling layer of patented gel, this mattress is designed with temperature comfort in mind. Some other mattresses are built to stay cool as well, but few include a full gel cooling layer near the top of the bed where it is most effective. The cooling gel has been paired with a special layer of convoluted foam designed to allow air to flow freely through the mattress, adding further to its cooling abilities. I know many people who have spent well in excess of $1500 on a memory foam mattress, and even more than that in some cases. The models I have reviewed here will not cost you anywhere near that much, yet you still have the benefit of memory foam technology. Even 12 Inch of that if you want, but you can also choose 6, 8 or 10 Inch and save even more! OK, so this isn’t the cheapest model I have in my selection of reviews, but the Ultimate Dreams 13” Gel Foam mattress has got pretty much everything. It includes a cooling layer, is available in no less than six sizes and really will help to keep those night-time aches and pains away. In fact, it has been compared to some of the large and expensive brand names out there but comes at a fraction of the price. I couldn’t forget the children could I? After all, we have to remember that growing bones and joints need to be protected and that’s why I have chosen the Sleep Master 6 inch as my best kids mattress. Apart from offering the best overnight support for a little body, this model also comes with an easy zip-off Jacquard cover (for those little accidents), and it won’t break the bank! You thought I had forgotten didn’t you! Well, my website wouldn’t be complete without reviews on mattress toppers as well, and you can find the whole selection here. However, my favorite is the Density Visco 4lb which is 3 inches thick. If you can’t afford a completely new mattress right now, this is the answer! 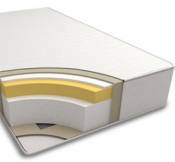 I also happen to think this topper is a great idea if you’re considering moving to memory foam for the first time and just want to give it a try. Unlike a traditional mattress, a memory foam mattress will need to be cared for slightly differently, and surprisingly maintenance in general can differ from brand to brand. However, there are some basic rules to follow, and you will find out what they are on this page. You can also take a look at this video page I’ve added which shows you how to steam clean a mattress. And if you’re someone who likes to know how the finished product eventually arrives at your door, you can also take a look at this great video I found that details how latex and memory foam mattresses are made. It doesn’t stop there on the information front! You can also find out more about the different types of foam (and there are quite a few to consider) or the considerations for side-, back- and stomach sleepers. This last one is probably the most important to at least have a quick look through. The reason for this is the position you sleep in has a lot to do with the type of foam mattress you should consider looking into, and the last thing I want is for you to come away from my website with the wrong product! Gaining the perfect level of comfort does have an awful lot to do with the type of mattress you have, but here are other things to remember that will help you finally get that uninterrupted night’s sleep you’ve been “day-dreaming” about. For one thing, your pillow could be the source of some of the discomfort you experience, and I have added another video with tips on finding the right pillow. Once you have some idea of what type is likely to suit you, I have added a really good cross section of reviews on the best bed pillows I’ve found which you can find here. Here you will find reviews on goose down comforters and goose down alternatives so if you have allergies, you will hopefully find something that “floats your boat”. Just in case you’ve made your bedroom the latest design project in your home, I have picked some of the best sets that will help add that finishing touch to the look (and of course, comfort). I know many of you won’t read all of the information above, and that’s just fine. I have tried to cover all angles so there is information on my homepage that will interest some and not others. What I do hope is that if you were confused before you arrived here, you now have a clearer idea of what mattress will suit you best. I also hope that if you intend to take a look around you at last manage to find that sleeping surface you’ve been dreaming about for so long. Enjoy, your memory foam mattress fan, Caroline.